The grass is green there! That is a great sign that you've had moisture. It is so sad to see everything dying here in Texas. Dan looks so smooth in his summer coat! He seems like a different donkey than the fuzzy winter Dan. Chicken: "Yo! Donkey! Make yourself useful and just open the door .....right over there... need to...um...run an errand." Donkey Doodle Dan: "I luv FG Susan, she loves me, we're a happy family...."
Chicken: "HEY! Doodle-Boy!" DOOR! OPEN!" I am with Sandy... Texas is miserably dry. Send some of that rain here? Hope your evening has been wonderful! I'm cracking up at Jeff's chicken/donkey dialogue! Hilarious! 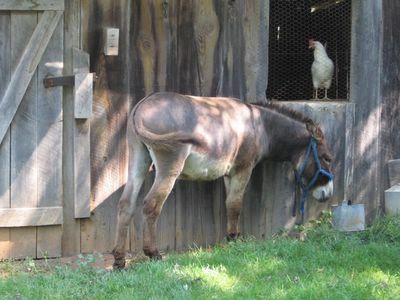 I only have one chicken right now, and I bet she and a donkey could get in loads of trouble. Keep up the awesome pix, FG! My chickens and horses enjoy each other's company too. What a delightful photo. I would love a Donkey Doodle Dandy. This may seem an odd comment but when I see photos of Dan I can't haelp but think of the children's book " The Silver Donkey" by Sonya Hartnett. It is a wonderful story and brave, peaceful donkeys play a significant role. Hey Sally and the rest of you bipeds: Have you all noticed how rarely poultry gets the heroic role in these sagas? Brave, gallant chickens make few appearances in traditional animal dramas . We're always the wacky comics losers ("the sky is falling"), or tragic, helpless victims of fate ("go tell aunt Rhodie"). The best we can hope for is to be prompt and "catch the worm." Well, we've had it. Whitey and I are studying the martial arts...and fencing and stuff...and we'll be saving sheep from mysterious predators, and defending Uncle Dan from, well, something or other...feathers gonna fly. Birds of Prey will drop their beaks in awe. Do you think we should get capes? Okay, I feel I should mention something here for the record: I swear (on a huge stack of adorable farm animals) that I am not the voice of Lindy The Super Chicken. Just so you know. Glad we got that straightened out (in case you were wondering). The thing is, the chickenz do have a little help posting. (It's a real pain typing in our kind of "hunt and peck"style.) We just haven't been leaving our buddy's address, 'cause we didn't want to disappoint anyone.